This spectacular, open-concept custom home built by Celebrity Homes, sits on a private N/S lot on one of the quietest roads in the guard-gated Stonegate subdivision of The Retreat. Upon entering the home, your guests will take immediate notice of the honed, Travertine flooring and the tall, 17′ tray ceilings in the foyer, dining and living areas. Kitchen w/white cabs & island, granite counters, gas cooktop, breakfast bar & open to the back patio & large family room w/vaulted ceiling & fireplace. Split, dual master suites, one w/a large sitting room w/fireplace & sliding door exit to the lush backyard. Remodeled master bath w/free-standing tub, snail shower & elegant Graff contemporary fixtures. Roof fully resurfaced (2014/18), Trane HVACs & refinished pebble pool (’14), BBQ & waterfall. Directions: Go east on Mountain View to Stonegate clubhouse & turn right into the guard gate. From gate, take first right into the Retreat, & then turn left on 113th Way & then right on Palomino. House on right. Full heating and cooling update in 2005. Approximate size: 13927.00 sq. ft. Please, send me more information on this property: MLS# 5880600 – $900,000 – 11244 E Palomino Road, Scottsdale, AZ 85259. 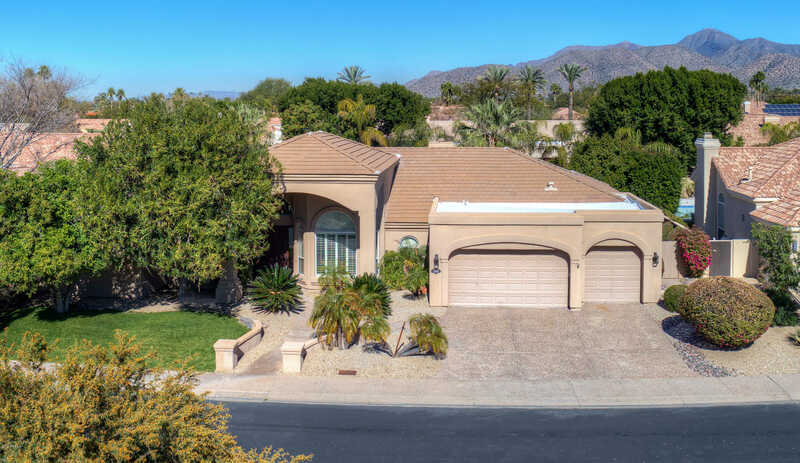 I would like to schedule a private showing for this property: MLS# 5880600 – $900,000 – 11244 E Palomino Road, Scottsdale, AZ 85259.